First negotiated in late June 1899, Treaty 8 embraced an area in northwestern Canada of some 840,000 square kilometers. The region included within Treaty 8 encompass much of what is now the northern half of Alberta, the northeastern quarter of British Columbia, the northwestern corner of Saskatchewan, and the area south of Hay River and Great Slave Lake in the Northwest Territories (map). 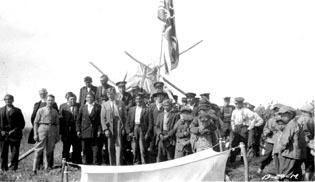 At the time, Treaty 8 was not only the largest land settlement ever undertaken by the federal government, but it was also the first time that Métis and Treaty Indians would be treated together. By virtue of their Aboriginal ancestry, the Métis of Athabasca were also deemed to have land rights which needed to be extinguished before the region could be opened to settlement. The federal government decided not to enter into treaty with the Métis, but instead to issue a one-time grant. These grants were conveyed to Métis family heads and their children by a special warrant called "scrip." Treaty 8 negotiations involved Oblate missionaries as well as Dene, Métis and Government leaders. In the end, a Treaty was signed that would prove contentious well into the 21st century.